J/News Articles: Glam + Foggy Cleveland 216 Regatta! (Cleveland, OH)- The fourth annual Cleveland (216) Regatta welcomed three J/22's, seven J/70's, and six J/105's this past weekend at Edgewater Yacht Club in Cleveland, Ohio. Three races were completed in shifty breeze on Saturday with 8-12 knots out of the Southwest, flat water and sunshine peeking through. On Sunday, unusual Cleveland fog prevailed and even with some breeze, the EYC PRO was unable to get any racing in due to visibility! Following racing, the teams met on the drysail area for the Quantum/ Sailing Inc. "SAIL-gate" where the Cleveland Browns football team pulled off an overtime win for the first time on a Sunday in two years! In the J/70 class, from Rochester, NY, Kevin Morgan on WILD CARD took first place over two Edgewater boats. Tod Sackett's team on FM came in second place and in third John Zelli's FREE ENERGY. The J/105 fleet shook things up this year with Jim Uhlir's TRIO taking home first place, Rob Mock's UNBRIDLED in second and Chip Schaffner's FALL LINE in third. Adam Gilbertson on DEUCE took first place in the J/22 fleet, followed by Tim Meaney's MEANIAC in second and Jim Latham's RAMBLE ON in third, all out of Edgewater Yacht Club. Many thanks to the sponsors: Quantum Sails Cleveland, Sailing Inc, Tito's Handmade Vodka, Pusser's Rum, Yuengling beer, Regatta Ginger Beer, Pope's, Caruso's Coffee, Distillata, West Marine and APS. Edgewater YC’s PRO Joe Colling, with help from Sam Patterson, put together a phenomenal team for Race Committee! The fifth annual Cleveland (216) Regatta will be held September 20-21, 2019 leading into the J/70 North American Championship September 21st through the 29th, all being held at Edgewater Yacht Club. We hope to see you there! 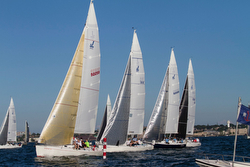 For Cleveland 215 Regatta sailing information Add to Flipboard Magazine.